These make a nice, hearty bun for your hot dog and toppings. M had his with lots of chili and cheese and the bun held up really nice and didn’t get soggy at all. The kids enjoyed these too, and my pickiest eater ate hers faster than her big brother. This recipe made 18 hot dog buns, so I was able to freeze half of these. 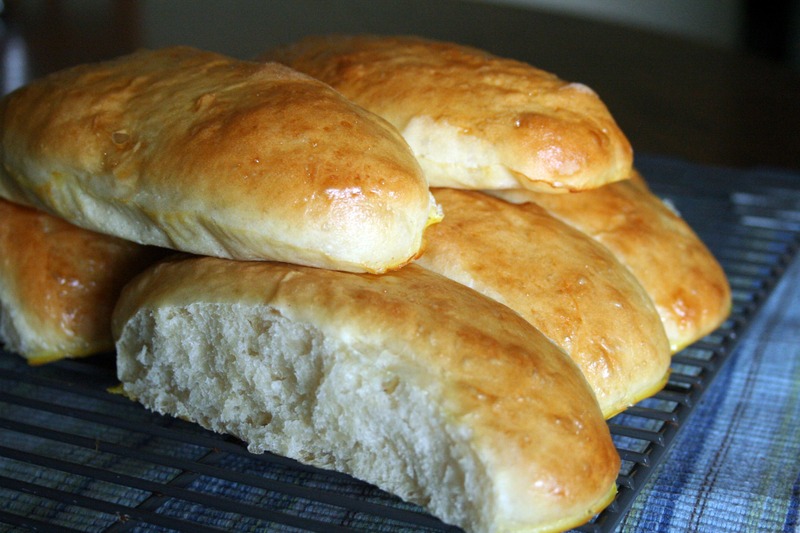 Next time I use this recipe, I might try to use half the dough for hamburger buns so I can have plenty on homemade buns on hand. Thanks for reading, enjoy! Mixing: In a large bowl, dissolve the sugar and then the yeast in the warm water. Add the milk, oil, salt and 3 cups of flour to the yeast mixture. Beat vigorously for 2 minutes.Gradually add flour, 1/4 cup at a time, until the dough begins to pull away from the sides of the bowl. Turn the dough out onto a floured work surface. Kneading: Knead until you have a smooth, elastic dough. Because this dough is so slack, you may find that a bowl scraper or bench knife can be helpful in scooping up the dough and folding it over on itself. Rising: Put the dough into an oiled bowl. Turn once to coat the entire ball of dough with oil. Cover with a tightly-woven dampened towel and let rise until doubled, about one hour. Shaping: Turn the dough out onto a lightly oiled work surface. Divide into 18 equal pieces. This is done most easily by dividing the dough first into thirds, then those thirds into halves, then the halves into thirds. Shape each piece into a ball. 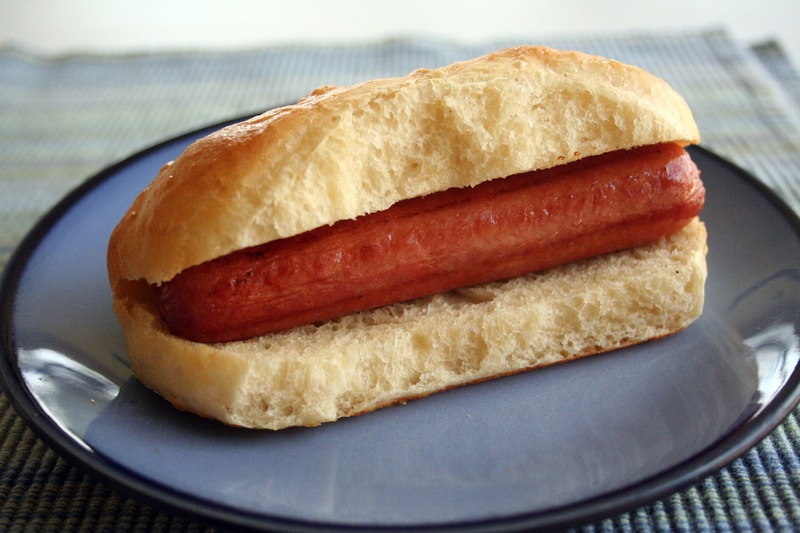 For hot-dog buns, roll the balls into cylinders, 4 1/2-inches in length. Flatten the cylinders slightly; dough rises more in the center so this will give a gently rounded top versus a high top. For soft-sided buns, place them on a well-seasoned baking sheet a half inch apart so they’ll grow together when they rise. For crisper buns, place them three inches apart. Second Rising: Cover with a towel and let rise until almost doubled, about 45 minutes. Baking: Fifteen minutes before you want to bake your buns, preheat your oven to 400°F. Just before baking, lightly brush the tops of the buns with the egg wash and sprinkle with whatever seeds strike your fancy. When the buns are done, remove them from the baking sheet to cool on a wire rack. This will prevent the crust from becoming soggy. I used this recipe and it turned out great. Only changes I made were to cut the recipe in half and I also replaced some of the all purpose flour with whole wheat flour. I greatly appreciated the step by step instructions. Thank you for this recipe!